Strobe: the simplest of the DCAM synths, but possessing more power under its hood than its single‑oscillator structure would suggest. 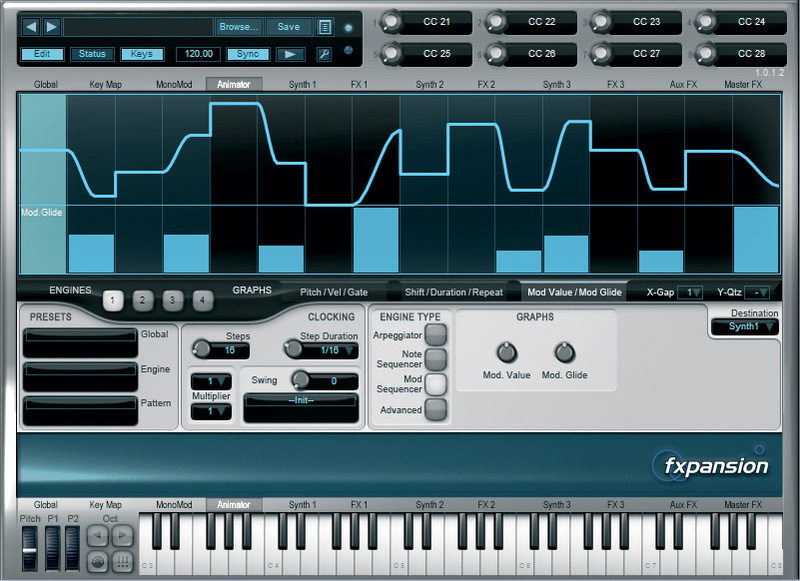 Widely known for their acclaimed BFD sampled drum software, FXpansion bring us DCAM Synth Squad, their first commercial virtual synth product. The DCAM (Discrete Component Analogue Modelling) package comprises not one, but three different synth instruments, called Strobe, Cypher and Amber, and a fourth component, Fusor. Fusor acts as a semi‑modular 'host environment' for the three synths, allowing them to be combined as a complete performance instrument, with its own suite of effects, key mappings, arpeggiators, step sequencer and more. If you think along the lines of Korg's Legacy software environment, which hosts a combination of their virtual Wavestation, Polysix and MS20 synths, you'll get some idea of how the three DCAM synths relate to Fusor. Each of the three synths can also be run as individual plug‑in instruments without having to be hosted within Fusor, if you wish. However, since none of the synths have their own built‑in effects such as reverb or delay (Fusor provides these and many more, as will be explained in a moment), you would need to apply effects via plug-ins of your own. The three DCAM instruments are each designed to model different types of analogue synth, and although FXpansion say no specific models are represented, certain influences are fairly clear, especially in Strobe and Amber. The synths are engineered to offer greater flexibility than the models that originally inspired them, whilst maintaining a consistency of design and operation across the whole suite. Extensive modulation facilities are the order of the day in all cases. (FXpansion have elected to call their modulation system 'TransMod', and details of how it works can be found in the 'Mod Squad' box.) Let's kick off with a broad overview of each DCAM synth. Cypher: the yellow areas represent the modulation amounts displayed for TransMod slot six. The central display screen gives live feedback on the status of waveforms, LFOs, filter and more. Strobe is the simplest of the three DCAM instruments. Think SH101, OB1 or Pro One — your classic single‑oscillator monophonic synths. Strobe offers a synthesis structure very similar to the SH101: a single oscillator with mixable saw, square and noise waveforms, a sub‑oscillator, pulse-width control (for square wave), filter, LFO and two ADSR envelopes — one for the amplifier and one for modulation duties. However, powerful extra features are on offer. 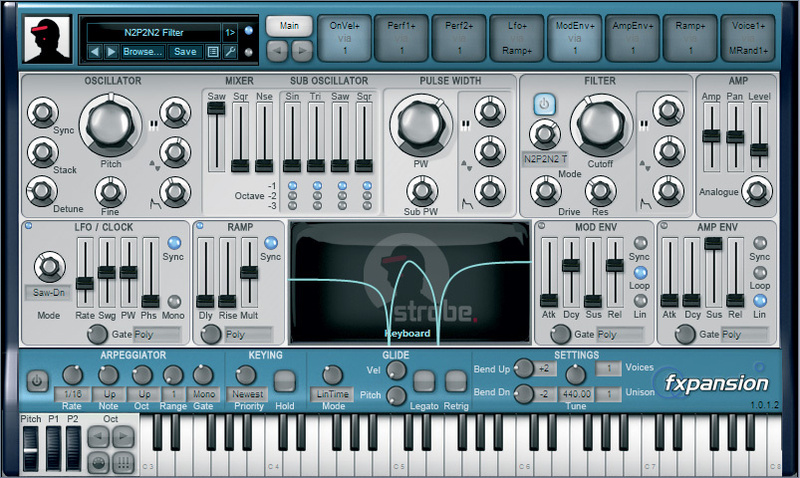 Firstly, Strobe is capable of up to 16‑voice polyphony, taking it into Juno 6/60/106 territory. The oscillator features variable oscillator sync, and can be stacked with up to five 'replicas' and detuned, giving a fat, multi‑wave sound ideal for huge pads, trance leads and the like. The sub‑oscillator offers four mixable waves — sine, triangle, saw and square — each of which can operate at one, two or three octaves below the main oscillator. The sub‑osc square wave also has its own pulse-width control. The filter offers no less than 22 filter modes, including low, band and high pass, peak, notch, and combinations of these in various two- and four‑pole flavours. The filter will self‑oscillate at high resonance settings, and can be tuned to a playable musical scale. A pre‑filter Drive control overdrives the filter, providing additional distortion to the waveform. Strobe's LFO is particularly versatile, offering 21 phase‑adjustable waveforms, plus swing and pulse-width amounts — these latter two being unusual and very useful features. A Ramp generator provides delay and rise-time functions to any modulation source within Strobe. Add to this a built‑in arpeggiator, glide, Unison voices and a staggering array of modulation possibilities, and you've got a synth that's capable of far more than the type of instruments on which it's modelled. 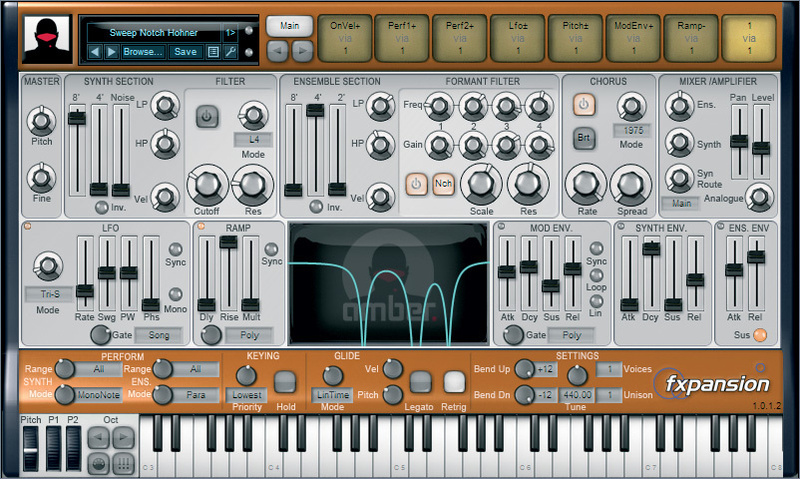 Amber: a modelled paraphonic string synthesizer. Although there is a certain degree of conceptual overlap between Cypher and Strobe, Cypher is considerably more complex. 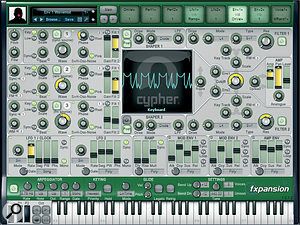 On the surface, Cypher appears to be a three-oscillator virtual analogue synth, and while it's perfectly capable in that role, its specific intent is to model synths that were capable of analogue‑style FM and audio‑rate modulation, such as Roland's Jupiter 8 — but with the precision and controllability of a digital instrument. Cypher's oscillators can modulate each other directly, to provide FM, sync, ring modulation and waveshaping via the following hardwired options: Osc 1 acts as the sync source for Osc 2 and 3, and it can be ring modulated by Osc 2. Osc 2 is the waveform mod source for Osc 3, and can be ring modulated by Osc 3. Osc 3 can apply FM to Osc 2, and is ring modulatable by Osc 1. Each oscillator's waveform is continuously variable, from a triangle wave through sawtooth to pulse — although, curiously, they don't quite manage to produce a pure square wave. All oscillator waveform phases are adjustable, with pink or white noise as a mixable option. Remembering that all the oscillators' parameters can be modulated at both audio‑rate frequencies and control‑rate frequencies (LFOs and envelopes, for example), it becomes clear that the tonal possibilities from oscillators alone are staggeringly huge! Cypher has two filters, which can be used in two parallel and two serial configurations. Each filter has a choice of eight types, with controls for drive, key tracking, resonance and FM input from Osc 3. A master cutoff knob adjusts the overall cutoff frequency of both filters, and each filter's cutoff can be individually offset via their Scale knobs. So although modulation applied to the master cutoff affects the filter pair as a whole, each filter is still controllable separately with the application of different modulators. The filters can be also be spread across the stereo output for wide, panoramic effects. Prior to each filter in the screen layout are shapers, designed to alter the harmonic content of the waveforms by distortion, and these can be applied pre‑ or post‑filter. Rounding off this brief tour of Cypher are the control‑rate modulators, comprising two LFOs, a ramp generator, two ADSR modulation envelopes and an amplifier ADSR, all of a similar spec to those in Strobe. 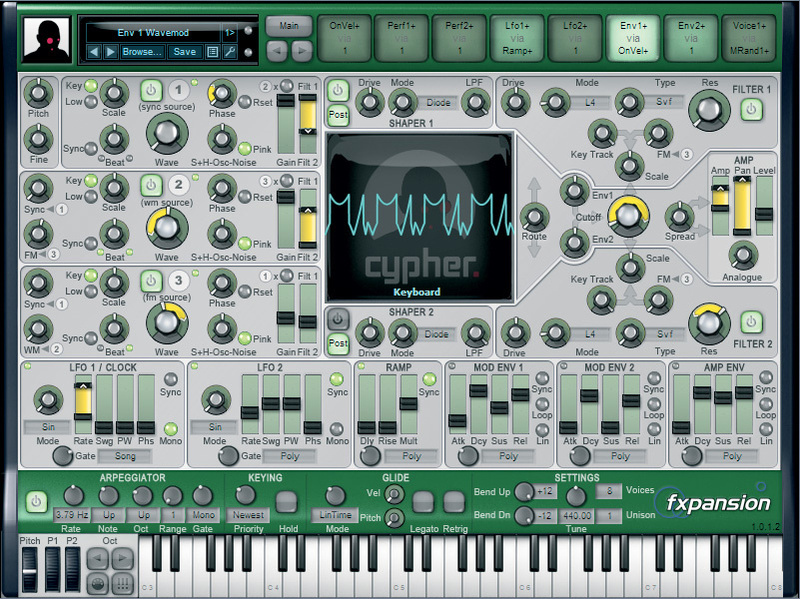 Cypher also has the same integral arpeggiator, glide and Unison voicing facilities as Strobe. Fusor's MonoMod page, showing the four LFOs and envelope followers, and active FuseMod routing on LFO 4. String synthesizers of the 1970s and 1980s generated sound using a divide‑down oscillator system, providing full polyphony from just 12 oscillators. Amber sets out to model the sound and characteristic 'paraphonic' behaviour of these classic instruments, of which the ARP Omnis and Roland RS505 were amongst the best known examples. Amber is 96‑note polyphonic, comprising two sections — Synth and Ensemble — both of which are always active. Their relative levels are adjustable, so if you want only the strings, simply turn the level of the Synth section right down, and vice versa. The Synth section comprises three mixable waveforms: 8' and 4' sawtooth, and noise. The initial tone of these can be modified with variable one‑pole LP and HP filters. This polyphonic signal is then summed and passed to a monophonic resonant filter, offering a choice of eight types of low‑pass, band‑pass, high‑pass, notch and peak characteristics. Further shaping of the Synth tone can be accomplished with the LFO, Mod Env ADSR (filter) and Synth Env ADSR (amplifier), as on a real paraphonic ensemble. Needless to say, like Strobe and Cypher, many further modulation options exist, as explained in the 'Mod Squad' box. The Synth section's output can optionally be routed via the Ensemble section's formant filter or chorus (more of which later) or just sent au naturel to the main output. The Ensemble section is basically similar to the Synth section, but with mixable 8', 4' and 2' sawtooth waves — the cellos, violas and violins of a typical string synth. The Chorus section models the all‑important bucket‑brigade chorus delay that gives string machines their signature lush quality. Three 'vintages' of Chorus are on offer: 1975, 1981 and 1984. To me, the first two of these suggest the Logan String Melody and the RS505, whilst the 1984 type is slightly harder to pin down, though similar to the 'Ensemble 2' setting of an RS202. One significant variation to the Synth section is the Ensemble's switchable formant filter. This is a four‑band design, each band being tunable from 50Hz to 5kHz, with variable gain, global scaling for all four bands, and resonance. The formant filter makes it possible to emulate string machines of almost any era, from the warmth of a Moog Opus 3 to the reediness of a Crumar Multiman. It's even possible to get very close to that famous VP330 choir sound. Performance options enable each sections' envelopes to adopt various characteristics — for example, when the Ensemble section is in 'para' mode, its amplifier envelope becomes fully polyphonic, providing independent attack and release envelopes for every note. This behaviour is typical of Logans, Elka Rhapsodys and the Korg Lambda. Alternatively, when set to 'MonoRel', the amplifier release envelope resets to zero when new notes are played, just like the Solina and ARP Omni. The same rules apply to the Synth section's am envelope — but bear in mind that any filter modulation derived from the Mod envelope will always behave monophonically, regardless of the amp envelope behaviour. Fusor's Animator in Modulation Sequencer mode, using Mod Glide to smooth transitions between neighbouring control values. Fusor is a 'host' environment into which up to three DCAM synths can be loaded in any combination. These are layered or split by assigning them to keymaps; any keymap can address any combination of synths. Fusor provides a comprehensive suite of 27 excellent effects, including chorus, phaser, compressor, delay, EQ and bit crusher amongst others — including a licensed version of Breverb's Overload reverb. 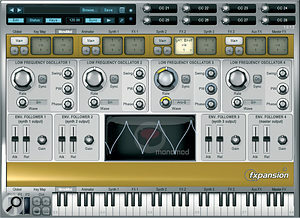 Three aux effects slots and three master effects inserts are provided for the overall output, while each synth has three insert effects slots and three aux sends. Fusor includes its own set of assignable monophonic modulators — four LFOs and four envelope followers, which form part of the FuseMod system, described elsewhere. Fusor's Animator could fill a review on its own! Essentially, it comprises four independent step-sequencer engines, each of which can function either as an arpeggiator, note sequencer or modulation sequencer of up to 128 steps in length. Arpeggios and sequences are presented in three sets of lanes, providing control over pitch, velocity, gate, shift, duration, repeat, mod value and mod glide for each step. Whichever mode it's in, Animator is always sync'ed to your host DAW's tempo, and gives plenty of triggering options to ensure things operate smoothly. The arpeggiator engine offers the usual directional playing modes and octave ranges, with additional refinements such as various note-order priorities, swing, and the charming Advance Octave feature, which alternates the octave ranges with each consecutive step, rather than waiting for the pattern to repeat. The Note sequencer takes the 'traditional' analogue sequencer approach, with note pitches, velocities, gates and durations being drawn in the control lanes. Note sequences are also transposable in real time from the keyboard. The Mod sequencer outputs only control data, not notes — and is the go‑to tool for modulating synth parameters in a rhythmical fashion. Steps can either output control changes abruptly, or the transitions from one value to the next can be smoothed by drawing different values in the Mod Glide lane. 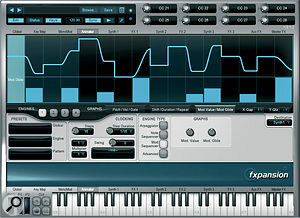 Animator engines are directed to the target synth via switches on the keymaps. Once again, any combination of Animator engines can be directed to any combination of loaded synths. And lastly, the eight Macro knobs at the top of Fusor's display are assignable via MIDI Learn to the hardware controller of your choice, and are available throughout DCAM elements as modulation sources. The assignment of these knobs is permanently storable from Fusor's preferences page. To be honest, when I first received DCAM Synth Squad I wasn't expecting anything out of the ordinary. Instead, I discovered a unified set of instruments of remarkable interest, depth and considerable sonic punch. Even if you never made a note of music with DCAM (which I seriously doubt) you'd never get bored just playing around with it. Strobe and Cypher both deliver fat, chunky sounds with a real sense of vitality that should appeal to virtual and analogue synth aficionados alike. While Cypher excels at conjuring up classic analogue machines of the past, its complex and extreme modulation powers take it far beyond the capabilities of hardwired analogue designs, and it proves to be an excellent tool for sonic experimentation and sound design, as well as being thoroughly musically satisfying. I'm sure Amber could sell very well on its own, because its flexibility makes it superior, in many ways, to using string synthesizer samples, and it also sounds very authentic. Space restrictions prevent further discussion of DCAM's finer details — but, nevertheless, the keen synthesist's appetite should be thoroughly whetted by now! DCAM Synth Squad is a fine foray into synthesis from FXpansion, and it deserves to do very well. Arturia's Moog Modular V and ARP 2600V both offer plenty of sophisticated modulation possibilities. Their Jupiter 8V features analogue‑style FM (which partly inspired Cypher), with the benefit of extended modulation tools. 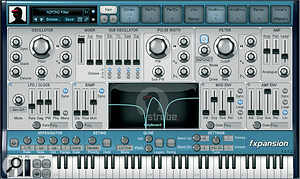 Rob Papen's Blue shares many of Cypher's attributes, has in‑built sequencing and arpeggiation along similar lines to Fusor, and is as capable of doing analogue emulations as it is of full six‑operator FM synthesis. 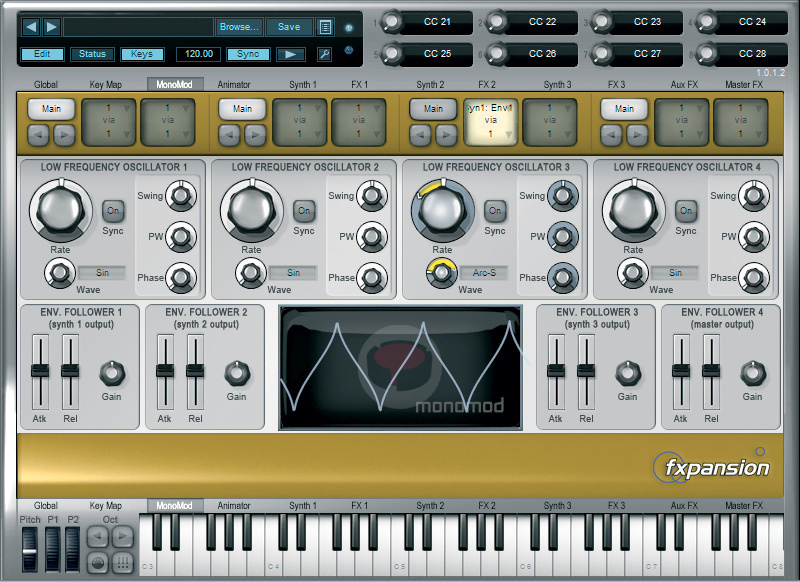 Gforce's VSM Virtual String Machine, although sample based, is an excellent source of authentic string synthesizer sounds, although it doesn't model the paraphonic behaviour of certain instruments. AlgoMusic's String Synthesizer V.1.1 is a free VST plug‑in modelling itself quite closely on the ARP Omni string sound. It even includes an ADSR envelope, filter, and delay and phaser effects (www.algomusic.net). Musicrow's Vintage Strings MkIII also models synth string sounds in detail, with plenty of tweakability (www.mcrow.net). Installing and authorising DCAM Synth Squad is quite straightforward. Authorisation is via the usual on‑line challenge/response keycode method, and I was up and running in just a few minutes. DCAM is 'compatible with all major plug‑in formats and sequencing environments', and runs as a VST, AU or RTAS plug‑in, or as a stand‑alone instrument. 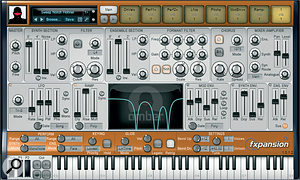 To run the individual synths as solo plug-ins, a 2GHz Intel processor is recommended, while the additional CPU demands of Fusor require a slightly more robust 2.4GHz Intel Core 2 Duo. Windows requirements are XP SP3 or Vista SP1, whilst Mac users will need at least OS 10.5.7. I've been running DCAM within Sonar 7 on Windows XP SP2 with no problems so far — and I continue to be optimistic! Modulation plays a significant role throughout the synths that form the DCAM suite. FXpansion have chosen to christen their modulation routing method 'TransMod', and it's employed on all three DCAM synths. Each synth has eight TransMod buttons, each representing a selectable modulation source, such as LFO, key velocity or envelope. If a source has any active destination parameters, its button glows gently, while if it's unassigned it shows dark. To make a routing, click the relevant button (it glows brightly), then drag the mouse in the coloured area above or below any fader. In the case of a knob, you would drag around its outer ring. This action displays a yellow strip or band, indicating the amount of positive or negative modulation applied. A single TransMod source can be applied to as many continuously variable parameters as you wish. To assign a different mod source to any TransMod button, clicking its upper area displays a drop‑down menu from which to make your selection. Clicking the middle displays the destinations (those yellow bands and rings). It's an intuitive and highly visual way of seeing what's happening. However, TransMod is more than just a simple 'A goes to B' matrix router. Each button's source can also be modified by an additional source, the main source being routed 'via' the second. For example, imagine you want to modulate filter cutoff with both Mod Envelope and key velocity. Rather than using two separate TransMod buttons, first assign the Mod Envelope as the principal source. Now click on the same button's lower area, and the drop‑down selection-menu appears again. This time, choose key velocity, and now, when you apply modulation to the cutoff by dragging around its outer ring, it responds to both sources. The choice of modulation sources is very comprehensive, encompassing everything from constant values to random, LFOs, envelopes, gates, voices and unison — in fact, too many to list! Voice and unison mod sources are especially powerful, enabling huge, detuned stacked‑oscillator textures when using multiple and unison voices (as determined in each synth's Settings panel). Fusor extends the concept even further with FuseMod... Things can get pretty wild from now on! Firstly, Fusor's own in‑built modulators (LFOs, envelope followers, step sequencers and macros) can modulate the parameters of any Fusor effects, the synth mix, and the effects send levels. Any DCAM synth that is running within Fusor also has access to Fusor's modulators, as well as its own. Fusor parameters have access to any loaded synths' modulators, and — as if that wasn't enough — any synth has access to the modulators of any other loaded synth. It's totally mental — in a positive way — yet surprisingly easy to get to grips with all this modtastic madness. Not enough for you? How about the Load To Mod Slot, a feature shared by each DCAM synth that allows you to morph from one patch to another. Simply load a preset, pick a TransMod source, click the Load To Mod Slot button and load your second preset. Now you can morph between the two presets using any modulation source you like. All this plus Fusor's assignable Macro Knobs and MIDI learn for virtually every parameter makes the term 'flexible' a bit of an understatement. Excellent fat, punchy analogue sounds. Extreme waveform-mangling possibilities in Cypher. Very authentic string-synthesis modelling in Amber. A dazzling array of modulation possibilities throughout DCAM. A comprehensive suite of quality effects within Fusor. Hits CPUs hard on high voice counts — most noticeably in Amber. DCAM offers the opportunity to delve very deeply into analogue-style synthesis if you wish, yet it never comes across as arcane. Fusor's semi-modular integration of the three synths brings much scope for creative experimentation, and the sounds of all three synths are bright, punchy and full of life. There is life after analogue — and DCAM earns a hearty recommendation.